Background: Leukotriene B4 (LTB4) has a key role in the pathophysiology of rheumatoid arthritis (RA). Objective: To investigate the inhibition of ex vivo LTB4-induced Mac-1 (CD11b/CD18) expression in leucocytes of patients with RA by the new oral LTB4 receptor antagonist BIIL 284. Methods: The pharmacokinetics and inhibition of LTB4-induced Mac-1 expression of BIIL 284 were characterised in 26 adult patients with RA who were treated with BIIL 284 25 mg, 150 mg, or placebo given once a day for 14 days according to a double blind, randomised, parallel group design. Results: Tmax of BIIL 315 in plasma (main metabolite and active principle of BIIL 284 in plasma) was achieved about four hours after drug administration, and Cmax,ss and AUC0–6h,ss increased in proportion to the dosage. 100% inhibition of LTB4-induced MAC-1 expression was reached after two hours (150 mg) or four hours (25 mg), showing a statistically significant difference in comparison with placebo (p<0.005). A longlasting dynamic effect was seen consistently even when plasma concentrations declined to very low values 24 hours after administration. Secondary clinical efficacy end points remained unchanged probably owing to the short duration of treatment. Adverse events (AEs) were reported in 12 patients during the study. No serious AEs or laboratory AEs were seen. Conclusions: Both the 25 mg and 150 mg doses of BIIL 284 safely and effectively inhibit Mac-1 expression on neutrophils; thus longer treatment with BIIL 284 may result in clinical benefit for patients with RA. The main biological functions of leukotriene B4 (LTB4) are recruitment and activation of inflammatory cells, particularly neutrophils, but also macrophages, monocytes, eosinophils, and lymphocytes.1 LTB4 also has an important role in controlling neutrophil apoptosis.2 LTB4 is produced mainly by macrophages and neutrophils3—that is, cell types that drive inflammatory processes. LTB4 can potentially contribute to accumulation not only of neutrophils but also of macrophages, T lymphocytes, and eosinophils at the site of inflammation. Effects on various immunological phenomena involving T cells, such as release of cytokines (interleukin 1, tumour necrosis factor (TNF), interferon gamma, and interleukin 2) and matrix metalloproteinases-2, -3, and -9, have been described.8,9 Therefore, it has been suggested that LTB4 plays an important part in the pathophysiology of inflammatory processes. In patients with rheumatoid arthritis (RA) the reported high concentration of LTB4 levels in both synovial fluid10–12 and serum,13 as well as the enhanced capacity for release of LTB4 by neutrophils,14 suggest that LTB4 has a key role in the pathophysiology of RA. Therefore, based upon theoretical as well as preclinical studies, it might be expected that BIIL 284 would be efficacious for the treatment of RA. As a first step in clinical development this two week study was performed to determine pharmacokinetic parameters and to assess the effect of BIIL 284 on Mac-1 expression in patients with RA. Only patients receiving a stable dose of concomitant disease modifying antirheumatic drugs (DMARDs) (parenteral gold, sulfasalazine, d-penicillamine, chloroquine/hydroxychloroquine) and/or corticosteroid treatment within the past two months could be included. If these drugs had changed the course of the disease during the study patients were excluded. Corticosteroids had to be restricted to doses ⩽10 mg/day or ⩽0.2 mg/kg/day (prednisone equivalent), whichever was lower, during the last month before study entry. Patients treated with DMARDs which are known to strongly influence leukotriene levels, such as methotrexate, were excluded from the study. Treatment with TNF blocking agents, such as etanercept, or receiving experimental treatment during the last three months before study entry as well as synovectomy and/or surgical treatment for RA in the previous month or during the trial led to exclusion. Changes in treatment with non-steroidal anti-inflammatory drugs within the last month before the study also led to exclusion. Pregnant or nursing women and patients with clinical evidence or a history of severe cardiovascular, hepatic, renal, respiratory, metabolic, haematological, immunological (other than RA), gastrointestinal, hormonal, or mental disorders were excluded from participation. This study was performed according to a double blind, double dummy, randomised, placebo controlled, parallel group design in adult patients with RA. Patients were treated orally either with 25 or 150 mg BIIL 284 or placebo once a day for 14 days. Drugs had to be taken after breakfast. Three visits (V2–V4) were made during the treatment period, preceded by a 14 day screening period and followed by a seven day period after treatment. This trial aimed primarily at studying the pharmacodynamics (inhibition of ex vivo LTB4-induced Mac-1 expression (IME)) and pharmacokinetics of the two oral doses of BIIL 284 in patients with RA. Additionally, the following secondary efficacy end points were analysed: tender joint count (TJC), swollen joint count (SJC), erythrocyte sedimentation rate (ESR), C reactive protein (CRP), patient’s assessment of pain, patient’s global assessment of disease activity, investigator’s global assessment of disease activity, patient’s assessment of physical function, and patient’s final global assessment of efficacy. To assess the safety profile of BIIL 284 the incidence of patients with adverse events (AEs), intensity of AEs, final global assessment of tolerability by patient and by investigator, withdrawal due to AEs, clinical findings, including blood pressure, pulse rate, and the incidence of laboratory AEs, were analysed. Full blood count, prothrombin time (quick), electrolytes, liver function tests, renal function and metabolic parameters, and urine dipstick were determined at visit 1 (screening), visit 2 (inclusion), and visit 4 (end of treatment). Furthermore, the presence of rheumatoid factor was determined at screening if there was no information available from previous laboratory examinations. Pharmacokinetic and pharmacodynamic measurements were made with the patient fasting. The trial drug was given with water at the hospital under medical supervision after a standardised continental breakfast. On days 1 (visit 2) and 14 (visit 4) blood samples were taken 0.5 hours before and 0.5, 1, 1.5, 2, 4, and 6 hours after drug administration. On day 7 (visit 3) a blood sample for plasma level was only taken 0.5 hours before drug administration. Ethylenediaminetetraacetic acid (EDTA) blood (4.9 ml) was taken from a forearm vein and directly stored on ice. The blood samples were centrifuged immediately after collection for 15 minutes at 4°C (2500 rpm, corresponding to about 1750 g). Without any delay, the plasma samples (two aliquots) were frozen and stored at −20°C or below until analysis. The plasma samples were analysed for BIIL 284 and its metabolites BIIL 260, BIIL 304, and BIIL 315 by a fully validated high performance liquid chromatography (HPLC)-mass spectrometry (MS)/MS method. Briefly, plasma was mixed with buffer containing the deuterated internal standards, and samples were purified by automated solid phase extraction in the 96 well plate format. Chromatography was performed on an analytical C18 reversed phase HPLC column with gradient elution. The substances were quantified by HPLC-MS/MS in the positive electrospray ionisation mode. Assay performance during the study was assessed by back-calculation of calibration standards, tabulation of the standard curve fit function parameters, and measurement of quality control samples. No interference of endogenous compounds was seen in the blank plasma of man. The following parameters for BIIL 315, and where possible for BIIL 304, were calculated using non-compartmental procedures in the program TopFit23: Cmax (first dose), tmax (first dose), AUC0-6h (first dose), Cmax,ss (steady state), tmax,ss (steady state), AUC0-6h,ss (steady state) = AUC311.5–318h,ss, Cpre,ss (steady state) Cmax, and Cmax,ss and Cpre,ss (concentration of analyte predose) were directly obtained from individual concentration-time profiles. Non-compartmental analysis of the plasma concentration data was used to estimate AUC0-6h, AUC0-6h,ss, values. Descriptive statistics were calculated. Further calculation of the accumulation factor and dose dependence of AUC0-6h,ss and Cmax,ss was performed, if possible. Pharmacodynamic analysis (inhibition of ex vivo LTB4 IME) of Mac-1 expression (ex vivo expression of CD11b/CD18) at basal state and after stimulation with 40 nM LTB4 was assessed. A volume of 1.2 ml EDTA blood was taken from a forearm vein at each measurement. The blood samples had to be processed within 1 hour after collection. Blood samples were taken at visit 2 (inclusion) and at visit 4 (end of treatment) 0.5 hours before and 0.5, 1, 1.5, 2, 4, and 6 hours after drug administration. All the determinations were done in duplicate. Blood (90 μl) was transferred to four polypropylene tubes (12×75 mm, Sarstedt, Germany). LTB4 (10 μl) was added to each of the two polypropylene tubes containing 90 μl blood, achieving a final concentration of 40 nM LTB4, (stimulated state); 10 μl of the solvent (basal state) was added to each of the other two tubes. These mixtures were incubated for 20 minutes at 37°C. Thereafter the samples were cooled and incubated for 30 minutes at 4°C with saturating concentrations of fluorescein isothiocyanate conjugated anti-CD11b/CD18 (CR3 (Bear-1); Boehringer Ingelheim Bioproducts, BMS 5009Fl.02). Subsequently, red blood cells were lysed using formic acid, and white blood cells were fixed with paraformaldehyde using a Coulter TQ prep solution and a TQ prep automated device in accordance with the manufacturer’s directions. The degree of fluorescent staining was determined on a flow cytometer. Data were collected in the list mode and granulocyte gates were defined by the forward and sideward dot scatterplots. Staining was further quantified by histogram analysis and expressed as mean channel fluorescence intensity. Five thousand gated cells were analysed. whereYi0stim is the LTB4 stimulated IME of subject i before administration of BIIL 284; Yi0 unstim is the LTB4 unstimulated IME of subject i before administration of BIIL 284; Yij stim is the LTB4 stimulated IME of subject i after administration of BIIL 284 at time j; Yi0 unstim is the LTB4 unstimulated IME of subject i after administration of BIIL 284 at time j. The primary analyses were performed on the population defined as the intention to treat population. A patient was considered to be within this population, if he/she adhered to the protocol in its major points and if no relevant problems occurred during measurements in the laboratory, such as debris in the blood samples drawn at baseline. The pharmacodynamic effect was measured as the percentage inhibition of LTB4 IME. A non-confirmative treatment comparison (both dosages v placebo), at each timepoint after the baseline measurement on day 1 when blood samples were taken, was performed to assess inhibition. A before-after comparison within each group was performed using the ratio. For both comparisons the Wilcoxon rank sum test was used. For the secondary end points the intention to treat population was taken as the population to be analysed. The American College of Rheumatology (ACR)20 improvement according to Felson et al24 and the Disease Activity Score (DAS)28 score25 were calculated from the secondary efficacy end points. For all the secondary efficacy end points, treatment comparisons were with baseline values using the Wilcoxon rank sum test. Twenty seven patients were enrolled, but one patient was not randomised because consent was withdrawn. Thus, 26 patients entered the study and were treated. 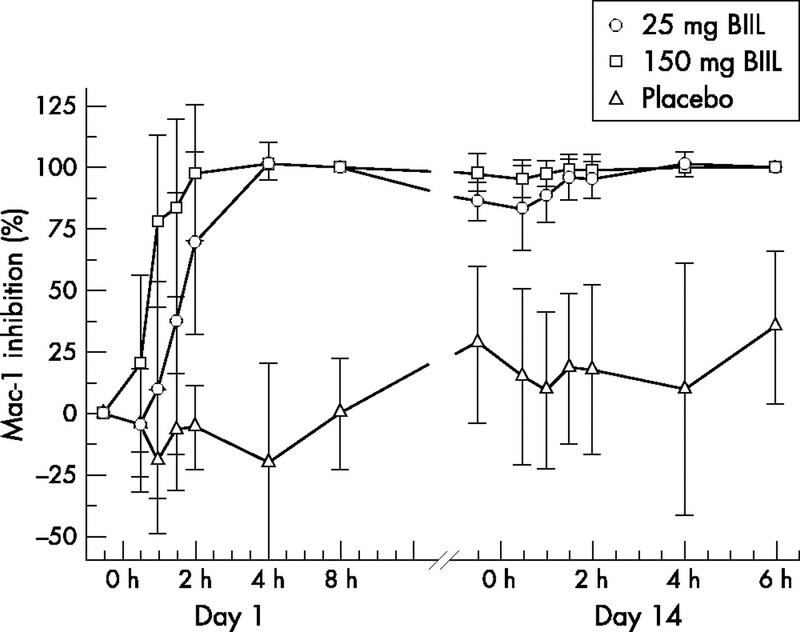 Seven patients were treated with 25 mg BIIL 284, 9 with 150 mg BIIL 284, and 10 with placebo. Table 1 gives the demographic data for all the patients. All the patients were white. More women (20 patients) than men (six patients) entered the study. In total both groups treated with verum comprised two men and 14 women. The average age of the patients was 51.3. There was no clinically relevant difference between the three treatment groups in any of the demographic parameters listed above. Table 1 also shows the duration of disease and the number of patients with positive rheumatoid factor in each group. According to the Steinbrocker classification, 18 patients belonged to class II, 5 patients to class III, and 3 patients to class I, indicating that the RA was of moderate severity in this study. All the patients in the study had at least four positive criteria for RA and therefore all the patients fulfilled the American Rheumatism Association criteria for RA.21 During the study three patients in the group treated with placebo and two treated with 150 mg BIIL 284 were concomitantly treated with sulfasalazine. In both the group treated with placebo and the group treated with 25 mg BIIL 284 one patient was cotreated with chloroquine and one patient with sodium aurothiomalate. Glucocorticoids were concomitantly given to four patients in the group treated with 25 mg BIIL 284, six patients treated with 150 mg BIIL 284, and seven patients treated with placebo. There were no significant differences in diagnosis between the three treatment groups. Compliance of patients treated with BIIL 284 was confirmed by pharmacokinetic analysis. In all the samples before treatment, concentrations of the four analytes were not detectable or at least below the limit of quantification. On average, plasma concentrations of BIIL 304 were about 10–20% of the respective plasma concentrations measured for BIIL 315, showing a similar concentration v time profile. In addition to its low receptor binding affinity, BIIL 304 is therefore not considered to play a relevant part in the pharmacodynamics of BIIL 284. On day 14 two patients showed low plasma concentrations v time profiles of BIIL 315 ZW and BIIL 304 ZW compared with most other patients in the 150 mg dosage group. Their plasma levels were comparable with those obtained in the 25 mg dosage group. The TJC and SJC in both these patients did not improve and the ESR and CRP even worsened. One of the two patients showed a delay in increase in IME. One patient who had low plasma levels on day 1 compared with most patients in the 150 mg dosage group was withdrawn from the study after day 4 owing to worsening of RA. Plasma concentrations of BIIL 260 and BIIL 284 were negligible as they were not detectable or below the limit of quantification in most plasma samples. 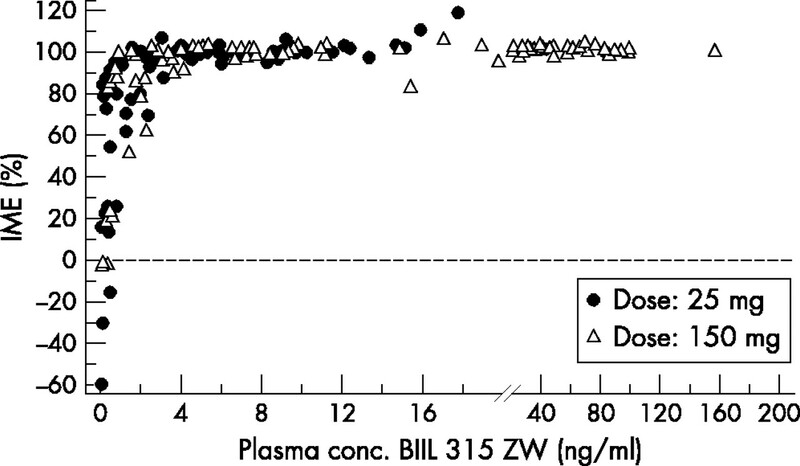 Plasma concentrations ranged from <0.05 to about 3 ng/ml for BIIL 260, from <0.25 to about 2 ng/ml for BIIL 284, from <0.10 to about 11 ng/ml for BIIL 304, and from <0.10 to about 160 ng/ml for BIIL 315. Intraindividual variability was high in all the dosage groups. Table 2 shows the geometric mean model-free pharmacokinetic parameters of the three dosage groups investigated with respect to BIIL 315 and BIIL 304 plasma concentration data. All the pharmacokinetic parameters of BIIL 315 determined indicate similar kinetics in the two dosage groups investigated but high interindividual variability (53.6–144% gCV). For AUC0-6h,ss, plasma concentrations of BIIL 304 ZW were about 7% of those of BIIL 315. Median Tmax for BIIL 315 was seen in both dosage groups four hours and more after the first dose and at steady state. Pre-dose plasma concentrations of BIIL 315 and BIIL 304 (only for 150 mg) on day 14 (Cpre,ss) were about 4% of the respective Cmax,ss levels. The Cmax and AUC0–6 h of BIIL 315 from day 1 to day 14 accumulated by a factor of around 1.3 and 1.4, respectively. Two patients were excluded from the pharmacodynamic analyses owing to debris in the blood samples used for calculating the MAC-1 expression. Thus, for the pharmacodynamic analyses a total of 24 patients were analysed. Figure 1 shows that the values determined 0.5 or 1 hour after drug intake for the inhibition of ex vivo LTB4 IME on day 1 in the 25 mg BIIL 284 group were variable. However, there was a clear rise in IME for all patients after 2 hours. After 4 and 6 hours, all patients showed 100% inhibition. At day 14, all the patients of the group treated with 25 mg BIIL 284 showed a decrease in the inhibition of LTB4 IME in at least one of the values measured at points between −0.5 and 1 hour. After 2 hours, six of the seven patients again showed about 100% inhibition. After 4 hours h, all the patients showed about 100% inhibition. Inhibition of ex vivo LTB4 IME (%) over time. Mean and SD of inhibition are plotted for the different treatment groups (n = 7 for 25 mg BIIL 284, n = 8 for 150 mg BIIL 284, n = 9 for placebo). In the group treated with 150 mg BIIL 284, all but one patient showed an immediate rise in inhibition of LTB4 IME on day 1 and showed about 100% inhibition from 2 hours onwards for all further points on day 1 and day 14. Only in one patient was the increase in IME delayed. Inhibition of LTB4 IME in this patient reached 100% after 4 hours, decreased on day 14 at point −0.5 hour to 81.3% and again reached about 100% inhibition after 4 hours. Even taking concomitant treatment or diagnosis into consideration, the reason for the delayed inhibition in this patient could not be determined, but correlated with low plasma concentrations of BIIL 315, comparable with those of a 25 mg dose. None of the patients treated with placebo showed a higher value than 32% inhibition of LTB4 IME on day 1. Median of inhibition in the placebo group was always below 22%, with the exception of the last value on day 14 (6 hours) which was 32.5%. On day 14 the range of inhibition was distinctly greater than on day 1. On day 14 all the individual measurements for IME were clearly lower than 80%, with the exception of measurements from two patients which reached 86.2% inhibition. The 4 and 6 hour values were available for only one patient on that day. Whether the higher levels in both these patients were due to technical problems could not be evaluated. A definite correlation between co-medication and the raised levels of IME could not be detected in these patients. Neither BIIL 315 nor other BIIL 284 metabolites could be detected in plasma samples of patients treated with placebo. Values for inhibition of LTB4 IME in the 25 mg BIIL 284 group were significant in comparison with placebo from 2 hours onwards (p<0.005). In comparison with placebo, values for the patients treated with 150 mg BIIL 284 were significant from 1 hour onwards (p<0.005). The Mac-1 ratio in the 25 mg BIIL 284 group was significantly different from baseline for the 2 hour measurement onwards (p<0.003). In the group treated with 150 mg BIIL 284, a significant difference was observed from 1 hour onwards (p<0.002). In the placebo group no statistically significant difference compared with baseline was seen at any time. Individual percentage inhibition of LTB4 IME values at days 1 and 14 for all the patients treated with BIIL 284 were plotted versus the respective BIIL 315 plasma concentrations (fig 2). Most IME values was clearly higher than 80% even when plasma concentrations of BIIL 284 315 ZW were low. Relationship between BIIL 284 315 ZW plasma concentrations and inhibition of ex vivo LTB4 induced Mac-1 expression (IME) on neutrophils. Summarised data after once daily oral administration of 25 mg (n = 7) and 150 mg (n = 8) BIIL 284 for all time points on day 1 and day 14. Table 3 shows that there was no significant effect on TJC, SJC, CRP, and ESR, or on other secondary efficacy end points (patient’s assessment of pain, patient’s global assessment of disease activity, investigator’s global assessment of disease activity, patient’s assessment of physical function, final global assessment of efficacy by patient, ACR20, and DAS28) between the different groups. Twelve (46%) patients reported AEs during the study: six of them in the 150 mg BIIL 284 group and three patients from each of the 25 mg BIIL 284 and the placebo groups. During the study, 25 AEs were reported. Table 4 shows the number of patients with AEs using WHO preferred terms. None of the patients reported any AE during the screening phase or the period after treatment. Most observed AEs were classified as musculoskeletal disorders, respiratory system disorders, or whole body/general disorders (n = 4 (15%) patients with AEs for each) and gastrointestinal system disorders (n = 3 (12%) patients with AEs). The most common AEs on the preferred term level were aggravation of arthritis (four), fatigue (three), headache, vertigo, dyspnoea, and upper respiratory tract infection (two of each). AEs in 18 (69%) patients were classified as mild; in 7 (27%) patients as moderate—fatigue in one patient treated with 25 mg BIIL 284 and one patient treated with 150 mg BIIL 284, headache in one patient treated with 150 mg BIIL 284, bronchitis in one patient treated with 25 mg BIIL 284 (leading to discontinuation before study completion), vertigo in one patient treated with placebo, and aggravation of arthritis in one patient treated with 150 mg BIIL 284 and one patient treated with placebo. An AE in only one (4%) patient was rated as severe—aggravation of RA leading to discontinuation before study completion. No serious AE was reported and none of the patients died. A causal relationship with the study drug was assumed for 10 AEs in five patients—two treated with 25 mg BIIL 284 and three treated with 150 mg BIIL 284. The following AEs were reported to be caused by the study drug: bronchitis in one patient treated with 25 mg BIIL 284, dyspnoea in one patient treated with 25 mg BIIL 284 and in one patient treated with 150 mg BIIL 284, fatigue in two patients treated with 150 mg BIIL 284, and headache, hypotension, diarrhoea, flatulence, and aggravation of arthritis each in one patient treated with 150 mg BIIL 284. Most laboratory values were normal and did not change markedly between baseline and the end of treatment. Individual and mean values outside the normal ranges were mostly related to RA (for example, ESR, CRP), underlying conditions, or concomitant diseases, and were rated by the investigators as not being of clinical relevance. No AEs were reported by the investigators in individual patients. Global assessment of tolerability by the investigator and the patients was readily comparable. Assessment of tolerability was rated as “good” in about 80% of all three groups by the investigator. In one patient of each treatment group, investigators assessed tolerability as “not satisfactory”. All the patients (100%) treated with placebo assessed tolerability as “good”. Tolerability was rated as “good” by six (86%) of the patients treated with 25 mg BIIL 284 and seven (78%) of the patients treated with 150 mg BIIL 284. In each of these two groups, one patient assessed tolerability as “not satisfactory”. There were no clinically significant changes in pulse rate, blood pressure, or echocardiogram, or other clinically significant findings. The determination of inhibition of LTB4 IME has been proved to be a marker for activity of LTB4 receptor antagonists.26 Therefore, IME was considered an adequate surrogate efficacy marker for the first step of clinical development of BIIL 284 in RA. A treatment period of 14 days was chosen because there was no safety basis from clinical data to allow for a period long enough to make sound judgments on the clinical efficacy in RA. Thus an important further aim was to evaluate the safety of BIIL 284 during and after 14 days of treatment as well as the pharmacokinetics and the pharmacodynamics. Baseline characteristics of patients participating in this study were quite typical for a population with moderately severe RA. There was no clinically relevant difference in any of the demographic parameters between the three treatment groups. As all the patients continued with their pre-study antirheumatic treatment, treatment with placebo did not increase the risk of the RA flaring in these patients. However, inclusion of a placebo group was justified by the need for a control group for IME. Thus, it could be expected that the design of the trial was suitable to study the above mentioned primary variables. On the other hand, for most DMARDs (with the exception of glucocorticoids and TNFα inhibitors such as etanercept) a treatment period of at least four weeks is needed to identify clinical improvement in patients with RA. Therefore, the study was not designed to identify efficacy in clinical parameters. The pharmacokinetic and pharmacodynamic analysis demonstrated that BIIL 284 is a long acting drug in patients with RA. Although its variability between patients is high, a longlasting pharmacodynamic effect was seen in all the patients, indicating that single daily dosing of BIIL 284 is sufficient in patients with RA. The primary efficacy (pharmacodynamic) parameter ex vivo LTB4 IME was considerably to completely inhibited at all doses starting on day 1 and inhibition lasted for at least 6 hours after treatment on day 14. Comparison of the time course of plasma concentrations and IME showed that a longlasting dynamic effect was seen consistently even when plasma concentrations declined to very low values (24 hours after administration). A highly statistically significant difference of IME in comparison with placebo was shown from 2 hours onwards for the group treated with 25 mg and from 1 hour onwards for the 150 mg BIIL 284 group. A 100% inhibition was reached earlier with 150 mg than with 25 mg BIIL 284 (2 hours v 4 hours) and was more durable in the 150 mg group. Therefore, the onset of action appears more pronounced and durable at the higher doses. So far, only one other study analysing the influence of LTB4 inhibition in RA has been published.18 In that study with zileuton, ionophore induced synthesis of LTB4 was selected as the pharmacodynamic end point. Zileuton decreased the ionophore induced synthesis of LTB4 by 70% after four weeks’ treatment. Owing to the important role of LTB4 mediated processes in the pathophysiology of RA, it seems to be reasonable to demand that an LTB4 antagonist should inhibit LTB4 mediated processes maximally. As BIIL 284 allows complete—that is, 100%, inhibition of LTB4 IME, it is expected that BIIL 284 may be a potent inhibitor of LTB4 mediated effects. For secondary clinical efficacy end points in this study (TJC, SJC, patient’s assessment of the current level of pain, patient’s global assessment of disease activity, investigator’s global assessment of disease activity, patient’s assessment of physical function, ESR, CRP, ACR20 improvement, DAS28, and global efficacy by patient) no improvement was seen. As this study focused on the pharmacodynamic end point inhibition of LTB4 IME, there were no inclusion criteria for the clinical parameters at baseline, which may partly explain the lack of effect on the secondary clinical efficacy end points. Thus, for example, a high CRP value was not demanded as an inclusion criterion. Correspondingly, CRP at baseline was normal for most patients. In the previous study performed with the LTB4 antagonist, zileuton, no significant clinical improvement was seen in patients treated for four weeks with zileuton in comparison with patients treated with placebo.18 Possibly, treatment with an LTB4 antagonist takes four or more weeks to show significant clinical benefit. With the exception of TNFα inhibitors, such as etanercept,27 and of glucocorticoids, an antirheumatic treatment period of four weeks or more is needed to identify clinical improvement in patients with RA. Therefore, only a study with a longer treatment period—for example, three months, either with BIIL 284 alone or in combination with methotrexate, can prove the clinical efficacy of BIIL 284. AEs were seen in 12/26 (46%) patients in the course of the study. Six of these patients were treated with 150 mg BIIL 284 and three patients each with either 25 mg BIIL 284 or placebo. No serious AE occurred in this study. Most AEs were judged as mild (in 69% of patients). Drug related AEs were reported in two patients treated with 25 mg BIIL 284 and three patients treated with 150 mg BIIL 284. No laboratory AEs occurred. Additionally, the assessment of global tolerance by patients or investigators was “good” in most patients in each treatment group. In comparison with other antirheumatic agents,28 the present profile of AEs caused by BIIL 284 appears to be acceptable. After exposure to the drug of 14 days in this trial, there were no specific safety risks which have to be considered in further studies. However, long term data and exposure of a larger number of patients are necessary to fully evaluate the safety of BIIL 284. In conclusion, both 25 mg and 150 mg doses of BIIL 284 can be recommended as safe and effective, having a complete and durable IME. Therefore, BIIL 284 may be a promising drug for the treatment of RA in the future. This work was supported by Boehringer-Ingelheim Pharma KG. Ford-Hutchinson AW. Leukotriene B4 inflammation. Crit Rev Immunol1990;10:1–11. Lee E, Lindo T, Jackson N, Meng-Choong L, Reynolds P, Hill A, et al. Reversal of human neutrophil survival by leukotriene B(4) receptor blockade and 5-lipoxygenase and 5-lipoxygenase activating protein inhibitors. Am J Respir Crit Care Med1999;160:2079–85. Hubbard RC, Rells G, Gadeck J, Pacholok S, Humes J, Crystal RG. Neutrophil accumulation in the lung in alpha-1-antitrypsin deficiency. Spontaneous release of leukotriene B4 by alveolar macrophages. J Clin Invest1991;88:891–7. Yokomizo T, Izumi T, Chang K, Takuwa Y, Shimizu T. A G-protein-coupled receptor for leukotriene B4 that mediates chemotaxis. Nature1997;387:620–4. Koshihara Y, Isono T, Oda H, Karube S. Measurement of sulfidopeptide leukotrienes and their metabolism in human synovial fluid of patients with rheumatoid arthritis. Prostaglandins Leukot Essent Fatty Acids1988;32:113–19. Lewis RA, Austen KF, Soberman RJ. Leukotrienes and other products of the lipoxygenase pathway. N Engl J Med1990;323:645–55. Morgan J, Stevens R, Uziel-Fusi S, Lau H, Hirschborn WL, Marshall P, et al. Multiple dose pharmacokinetics of a mono-aryl-amidine compound (CGS-25019 C) and its inhibition of dihydroxyleukotrienes (LTB4)-induced CD11beta expression. Clin Pharmacol Ther1995;57:153. Rola-Pleszczynski M, Bouvrette L, Gingras D, Girard M. Identification of interferon-gamma as the lymphokine that mediates leukotriene B4-induced immunoregulation. J Immunol1987;139:513–17. Leppert D, Hausser SL, Kishiyama JL, Zengl L, Goetzl EJ. Stimulation of matrix metalloproteinase-dependent migration of T cells by eicosanoids. FASEB J1995;9:1473–81. Klickstein LB, Shapleigh C, Geoetzl EJ. Lipoxygenation of arachidonic acid as source of polymorphonuclear leukocyte chemotactic factors in synovial fluid and tissue in rheumatoid arthritis and spondyloarthritis. J Clin Invest1980;66:1166–70. Davidson EM, Rae S, Smith JH. Leukotriene B4, a mediator of inflammation present in synovial fluid in rheumatoid arthritis. Ann Rheum Dis1983;42:677–9. Moilanen E. Prostanoids and leukotrienes in rheumatoid synovitis. Pharmacol Toxicol1994;75(suppl 2):4–8. Gursel T, Firat S, Ercan ZS. Increased serum leukotriene B4 level in the active stage of rheumatoid arthritis in children. Prostaglandins Leukot Essent Fatty Acids1997;56:205–7. Elmgreen J, Nielsen OH, Ahnfelt-Ronne I. Enhanced capacity for release of leukotriene by neutrophils in rheumatoid arthritis. Ann Rheum Dis1987;46:501–5. Griffiths RJ, Pettipher ER, Koch K, Farrell CA. Leukotriene B4 plays a critical role in progression, of collagen-induced arthritis. Proc Natl Acad Sci USA1995;92:517–21. Griffiths RJ, Smith MA, Roach ML, Stock JL, Byrum RS, Koller BH. Collagen-induced arthritis is reduced in 5-lipoxygenase-activating protein-deficient mice. J Exp Med1997;185:1123–9. Chen XS, Sheller JR, Johnson EN, Funk CD. Role of leukotriene revealed by targeted disruption of the 5-lipoxygenase gene. Nature1994;372:179–82. Weinblatt ME, Kremer JM, Coblyn JS, Helfgott S, Maier AL, Petzrillo G, et al. Zileuton, a 5-lipoxygenase inhibitor in rheumatoid arthritis. J Rheumatol1992;19:1537–41. Sperling RI, Benincaso AI, Anderson RJ, Cobly JS, Austen KF, Weinblatt ME. Acute and chronic suppression of leukotriene B4 synthesis ex vivo in neutrophils from patients with rheumaroid arthritis beginning treatment with methotrexate. Arthritis Rheum1992;35:376–84. Birke FW, Meade CJ, Anderskewitz R, Speck GA, Jennewein HM. In vitro and in vivo pharmacological characterization of BIIL 284, a new and potent leukotriene B4 receptor antagonist. J Pharmacol Exp Ther2001;297:458–66. Arnett FC, Edwothy SM, Bloch DA, Wilder RL, Hunder G. American Rheumatism Association 1987 revised criteria for the classification of rheumatoid arthritis. Arthritis Rheum1988;31:315–24. Heinzel G, Woloszczak W, Thomann P, eds. TopFit Version 2.0: Pharmacokinetic and pharmacodynamic data analysis system for the PC Stuttgart: Gustav Fischer Verlag, 1993. Felson DT, Anderson JJ, Boers M, Bombardier C, Furst D, Goldsmith C, et al. American College of Rheumatology preliminary definition of improvement in rheumatoid arthritis. Arthritis Rheum1995;38:727–35. van Gestel AM, Haagsma CJ, van Riel PLCM. Validation of rheumatoid arthritis improvement criteria that includes simplified joint counts. Arthritis Rheum1998;41:1845–50. van Pelt JP, de Jong EM, van Erp PE, Mitchell MI, Marder P, Spaethe SM, et al. The regulation of CD11b intergrin levels on human blood leukocytes and leukotriene B4-Stimulated skin by a specific leukotriene B4 receptor antagonist (LY293111). Biochem Pharmacol1997;53:1005–12. O’Dell JR. Anticytokine therapy–a new era in the treatment of rheumatoid arthritis? N Engl J Med1999;340:310–12. Wijnands MJH, van Riel PLCM. Management of adverse effects of disease modifying antirheumatic drugs. Drug Safety1995;13:219–27.